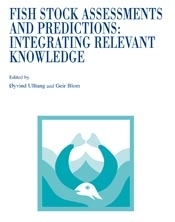 This volume contains a set of papers resulting from communications presented at the SAP symposium "Fish Stock Assessments and Predictions: Integrating Relevant Knowledge" held in Bergen in December 2000. A variety of existing scientific knowledge can be better utilised for improving fish stock assessments and predictions. In particular, failure to take account of environmental effects, including both biotic and abiotic factors in the term environment, is a serious source of error in present fish stock assessments and limits the time horizon of reliable predictions. The papers summarise the state of the art and emphasis the potential gains by integrating relevant knowledge of processes affecting fish stocks.